Blogger Connections and a Phenomenal Blogger Surprise! The last day of my trip had been one that I’ve looked forward to most, since I knew that I’d meet quite a few new blogging friends on this day. Blythe and her adorable son Theo, and Christina and her doll-face baby, Oliver met Elisabeth and I at the Nurnberg train station for what was to be a chance to share a few relaxed hours getting to know each other off-line. Unfortunately, though, just as we were settling in and starting to order cappuccinos, Elisabeth and I discovered that the train we thought would leave at 2:00 was actually leaving at 1:00 – and we hadn’t bought tickets yet! We quickly excused ourselves, snapped a hasty photo and flew down the escalator, determined to make the 1:00 train because we had more blogger friends waiting for us in Frankfurt! As we disembarked at the Frankfurt train station two hours later, we immediately recognized a familiar face. Geoffry had come back to see us again and was awaiting our arrival on the platform. It was wonderful to see him again and I was honored that he’d driven from Koeln to Frankfurt to see us just days after we’d met. “Lionel never talks to me,” he quipped (ha!) “and I really want to find out how Oktoberfest went!” “Plus,” he added, “I have to catch a flight to Estonia on the same day that you’re flying home to Seattle.” The three of us set off toward Starbuck’s, where Jen, Sparky, J, and Richard were waiting. Jen and I needed no introduction, having Skyped in months previous and insisting that “Dude! We’re both from the Bay Area; we are soooo connected!” Jen and I were never strangers, not for a split second, and today just hours after we parted in a parking lot in Frankfurt, I can honestly say that I already miss her gregarious laugh, her inviting demeanor and her… well, her absolutely insanity (the good kind, of course)! God, what an amazing woman… who is married to an amazing man. I now get why Sparky is nicknamed Sparky: he sparks conversation, sparks a connection, sparks exuberance and just plain adds a bit of electricity to all of his interactions. And damn, that man is smart… just like his wife! I found J to be wonderfully warm, full of life, and highly intelligent. He planned the perfect place for all of us to meet – Yours Australian Bar and Grill – and we all (accompanied by Richard, a blogger who I don’t know well, but have decided that I must add his blog to my Google Reader list!) partied hearty long into the night, laughing like lifelong friends and absolutely enjoying each others’ company, sad at the prospect that our evening together couldn’t go on forever. There is no doubt that the friendships I’ve formed with my blogger friends are as true, as deep, and as genuine (and maybe even more so) as my “real life” friendships, and I would welcome any of them into my home and into my life in Seattle any time! Just let me know, guys, when you’ll be arriving. But the most amazing event of the evening was yet to come. As we settled in at Yours, laughing together and sharing blogging memories, a package was delivered to our table. A package for me. I was completely baffled. Why would someone send me a package – and why would they send me a package care of the blogger meet-up in Frankfurt? HUH?! My new friends were as mystified as I was and jokingly moved aside as I began opening the box. I would have loved to attend tonight’s blogger meeting but couldn’t make it. I was moved by your memories of Ruhpolding and wanted you to have this. I hope my gift makes it in one piece. It’s an antique German Sammelgedeck from Ruhpolding. Anyone who was there (even people at neighboring tables) will tell you, my dear anonymous blogging friend, that I was moved close to tears. I am touched so deeply that anyone (anyone!) would ever do something so incredibly nice for me! The fact that my normal ol’ blog with normal ol’ stories and impressions has touched anyone enough to give me such a gift is just beyond me. I am still speechless. And grateful. And appreciative. And thrilled. Thank you, who ever you are. Thank you so very much! My new (antique) porcelain from Ruhpolding will definitely grace our home in a very special place… perhaps on the antique piano that my mother so enjoyed playing. Anyone who is skeptical of the connections and friendships that can be found within the blogosphere and anyone who doubts that a blog can make any sort of difference or impression in people’s “real lives” needs only to have experienced my life – my new friendships and my astounding gift -- yesterday! It is very, very real, and it feels so very, very good! After our magical day in Heidelberg, just as Elisabeth and I were getting ready to drift off to sleep, the “handy klingelt” (the cell phone rang). It was Lionel, Geoffry’s son, and Elisabeth’s new friend. “No discussion necessary, m’dear,” I assured her. “You can’t not go!” Elisabeth and Lionel had discussed the possibility of going to Oktoberfest together and now Lionel, the charming, connected and debonair Pied Piper of Party had found a way to make it happen… with the popular German reggae band and his good buddies, Jamaram, no less! A flurry of activity followed, from cancellation of a hotel room in Wurzburg to a call to my friend Thomas, to research into train times. Elisabeth would head to Munchen the next day to spend time with her new friends and I’d go to Nurnberg to spend time with Thomas– and to finally meet his wife, Petra, with whom I had spoken on the phone and to whom Elisabeth had grown close in 2005 when she lived with the family for a few weeks, but who I had still not met. Elisabeth and I took a train together to Stuttgart, then parted ways, planning to see each other late the next day or early on the day after – depending, in large part, on how hard she’d party at Oktoberfest. As I boarded the train for Nurnberg I was hit by a sudden case of butterflies… as always happens when I see Thomas after years apart. In 2001, when I went to Germany with Mom and Thomas came to visit us in Ruhpolding, my butterflies were especially persistent. I was 25 when he’d last seen me and now 20 years had passed. Would we still share the close connection that that we felt immediately when we met in 1980 and that had persisted as letter-writing friends as we both married, raised children and settled into our very different lives on very different continents? As it turns out, we did maintain our connection of close friendship, both in 2001 and later in 2004, and during both visits we gabbed on and on, in a smattering of German and English (but mostly English), reveling in the chance to connect again in the friendship we’d nurtured. Although our friendship has been a completely platonic one for 26 years now, there is something about seeing an old lover again, and I found myself combing my hair and refreshing my make-up as the train approached the small station in his town. A candle that burned as brightly as ours did so many years ago is never absolutely and completely extinguished (admit it; you all know this! ), and I couldn’t help but wonder whether my turning 50 (yes, I was the older woman) would cause him to look at me this time as just an old lady acquaintance instead of as a deeply connected friend. The friendship, it turns out, is healthy and Thomas and I connected as we had during my visits of the past six years: we shared stories of our families and our careers and our children and our very different lives on very different continents. And this time I knew I’d finally get to meet Thomas’ wife, Petra, and his older daughter Katarina (his younger daughter had stayed with us two summers ago). The butterflies came back at the thought of meeting Petra. What if she didn’t like me? What if we had nothing to say to each other? What if she decided that she didn’t want Thomas keeping in touch with me? I knew logically that my concerns were silly, as I’d spoken to Petra on the phone and liked her very much each time. And Elisabeth had spoken so highly of her, assuring me that she was loving and kind. 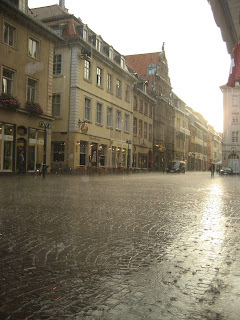 But still, when it was time to meet her after a day of drenched sight-seeing on a particularly rainy day in Nurnberg, the butterflies were swarming. As we entered the house, Petra first saw Elisabeth (who she calls “little Carol”) and drew her into a long hug, speaking (in German) of the fond memory she had of Elisabeth’s visit in 2005. Watching Petra’s genuine kindness and fondness for my daughter gave me an immediate sense of kinship and I liked her immensely even before she opened her arms to me and we hugged, truly happy to have finally met. That evening, Petra and I laughed heartily together, greatly enjoying each other’s company. I knew I’d made a new friend, and even now as I sit in the Copenhagen airport as we await our final flight home, I know that my connection with Petra, after all these years and all this trepidation, is one of the highlights of my trip. I know that I have made a new friend who, like her husband, I will feel connected to for many years to come. I know – I’m lucky. It’s not often than a passionate romance mellows into a true and sincere lifetime friendship, and it’s not often that future spouses are so accepting – and even encouraging – of that friendship. But it’s also not often that people like Thomas and Petra come along in one’s life. I am truly blessed. After returning the car (who wants it?!) and saying goodbye to Tom at the Frankfurt Airport, Elisabeth and I hopped on a train headed for Heidelburg. This, my third distinct week in Germany, is now focused on traveling with my exuberant daughter! From the moment we left the airport, we adopted an adventurous, let's-just-fly-by-the-seat-of-our-pants spirit. What fun! 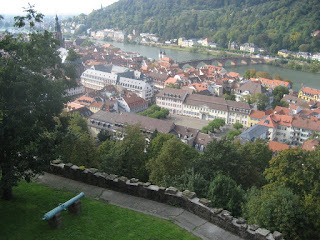 I can hardly describe Heidelburg; it just defies a description that encompasses the beauty and emotion here. Maybe it’s the weather – heat and sun turning quickly into a powerful summer storm – but this place feels purely magical! 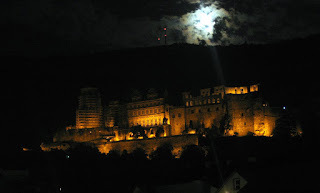 After settling into the hotel and admiring the view of the Alte Brucke from our room, we headed directly for the castle – which instantly became my favorite castle of all I’ve seen in Germany! Elisabeth’s quest for adventure led us into underground passageways and dark, musty rooms, and for three hours we walked around this absolutely majestic fortress, in awe. When the sky became deep purple and the sudden rain poured to the ground, I was almost overwhelmed with emotion. But it was hearing my favorite Bach Tocata and Fugue coming from the town’s beautiful church that did me in. 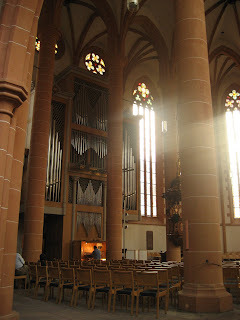 As we entered the church, the powerful sounds of the organ playing one of my favorite pieces, and the realization that I was hearing this beauty in an amazing town in Germany with my daughter (and missing my mother) was too much and I found myself silently sobbing, tears streaming down my face, completely overwhelmed. Elisabeth and I stood in the church, our arms wrapped around each other, my eyes closed so that I could completely feel every single drop of the experience. I don’t think I’ve ever felt so filled with awe and gratitude as I was at that moment. It was absolute magic. We ended the day with dinner and beer in a pub seemingly dug into rock, then walked the quaint Hauptstrasse, and finally fell into bed, exhausted. A note to anyone planning a trip to Berlin: If you plan to stay for any less than a week, you will leave knowing that you absolutely MUST come back, for it is absolutely impossible to absorb everything the city has to offer in less than that. Allowing two weeks or six weeks (or a year… or a lifetime) would be a much wiser plan. 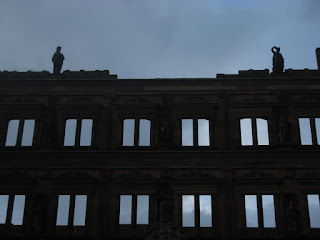 We left the fairytale Kassel area, where they live, at about 5:30 PM on Friday, arriving in Charlottenburg at about 9:30. C and B treated us to a wonderful hotel right in the heart of this bustling, yet quaint and personable section of the city. Upon arriving, we at dinner at the sidewalk café area of a friendly neighborhood bistro. I had been to Berlin twice before, once in ’73 and once in ’80. I wish I could remember those trips better, so I could fully appreciate the contrast, but my memories are hazy. I DO remember the wall, and even viewing it in the “touristy” area of Potsdamer Platz, where we climbed a few wooden steps and were allowed to see over the wall into East Berlin. And I remember Check Point Charlie, where the guards with machine guns tore apart my brush, opened my tampon container, and slid mirrors under the car. I remember seeing the Brandenberger Gate… sort of. I remember the world behind Check Point Charlie as completely gray – the people, the buildings, the air… everything. But those areas bore absolutely NO resemblance now to my memory of them then. None. Instead, they are surrounded by shiny new buildings, beautiful open areas and energetic, colorful people. Bright and early on Saturday morning, we arrived at the Reichstag, the seat of the German government, and a fabulously restored building with an architectural marvel, a huge spiral viewing area on the large dome situated on top of the building. Somehow (I can’t begin to understand the engineering and optics involved! ), the moveable mirrors allow just tons of light into the history-laden (some of it tragic) building itself. I love the symbolism. The Brandenberg Gate is now wide open, bustling with people (yes, tourist bus after tourist bus! ), the path of the former Wall marked only by a line of square rocks in the road. Potsdamer Platz, which was a no-mans land during the years of the Wall, now houses the absolutely immense Sony Center, a business and economic hub that screams of a contrast to its former identity. Elisabeth and I visited the Holocaust Memorial, a collection of 2500+ simple, stark, charcoal gray rectangular (grave-shaped) monoliths placed on a large expanse of rolling earth, some hip-high and some many times taller than a person. Without even realizing it, one could get lost in the stark, yet overwhelming denseness of it all. I love the symbolism. Under the memorial is an exhibit commemorating the murder of the 7 million Jews (yes, the German people have faced their past head-on), which I found to be overwhelming. We enjoyed dinner at a fabulous and very authentic Italian restaurant and topped it all off with a night cap at yet another sidewalk bistro, many of which seemed to be open all night. The next day we had a lovely breakfast at Anna Blume, an example of a thriving bakery and café (and flower store!) in the former East area. Wonderful! Then off to the TV tower and the beautiful buildings surrounding it (by this time I was feeling overwhelmed by history and information and, admittedly, retained fewer details! ), and then off to the palace of Sans Souci in Potsdam before returning to Kassel, exhausted, and falling into bed – but only after the arduous task of packing for Tom’s return to Seattle (I sent much home with him) and Elisabeth’s and my continued trip. Before we went to bed, Laura’s father made us all “Strammer Max,” a German specialty consisting of eggs and ham atop brown bread (yum). And then, Laura’s wonderful parents and our dear new friends, presented Tom and I with two “German clouds” (as I call them), the individually-sized fluffy down comforters which are found on all beds here. Really – they were just far too good to us! Saying goodbye was excruciating again, because this time we weren’t just saying goodbye to Laura, but to her whole family… people who we definitely regard as part of OUR family now, and who we have come to love as much as we love Laura. We insisted that they come to Seattle soon, and hopefully next summer we’ll be able to share some of our home with them! 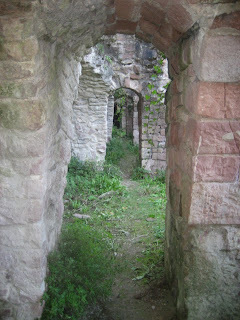 This is the land of Grimm's fairy tales, and when you visit the local castles you can really feel it! I half expected to see a princess with her pointed, veiled hat riding off with her handsome prince on a white steed! I'll take this over Neuschwanstein any day, having now visited both. We were all alone at this castle, and there wasn't a tourist gift shop around for miles. This is the way to experience Germany, I think. Although we played tourist for the first week, the past week has been with family and friends, and we've had the chance to experience small-town life in Germany and to visit non-touristy, but at least as fascinating, and history-rich sights. This afternoon we'll head to Berlin with Laura's family (whom we absolutely adore! ), and then on Monday morning we'll take Tom to the airport for his flight back to Seattle. Then Elisabeth and I will continue on to Heidelbeg (perhaps with Laura's sister, who has a break from the university), Würzburg, and finally to Nurnberg to visit my dear friend Thomas (and I will finally get to meet his wife, who I have spoken to on the phone quite a few times, and who I ike a lot) and to have a mini Blogger meet-up (Christina and Blythe... can't wait!) before getting on the train and heading for Frankfurt for another Blogger meet-up (Jen, J, Geoffrey and...?) and (sob, sob) getting on the plane to Seattle. Even my laptop has gone through withdrawals! When I turn it on now, it begs for an internet connection, as if it needs its fix! 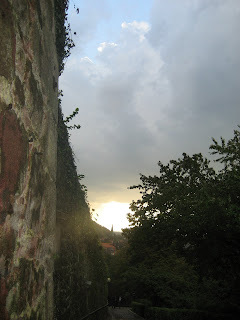 Fortunately, I was able to connect for the first time today, courtesy of family (my cousin's family and my god-daughter) in Dillenburg. So finally I'll be able to write a few words as well as post a slideshow. I wish I'd been keeping a journal! But as is often the case when one travels, the days are just so jam-packed that there's no down time to write. By the end of the day, we just fall into our beds, tired from walking and sightseeing (as well as from beer drinking!)... and it starts all over again the next day. The two Bavarian houses are Steinbergerhof, where we've been staying for the past three days (posted the view from our window yesterday). The church is Ruhpolding's town church -- beautiful! The castle is Herrenchiemsee and the island is Frauninsel. The satisfied man is... GUESS! Writing from an Internet Cafe (why did I bring my laptop?!) before leaving for a day on the Alpen roads, from Ruhpolding to Garmish via Innsbruck and Mittenwald. We’ll be leaving the Uhland Hotel (see photo) in Munchen today for my favorite place on earth, the town of Ruhpolding, near my mother’s hometown of Traunstein… which is not far from Salzburg (which we’ll visit, of course). I have a feeling that our Internet options there will be even more limited than our options here, so here are a few photos of Munchen to “tide you over” until I can post more – which will likely be when we come out of the Alps and onto the Romatische Strasse, next Saturday. A really prevalent, but admittedly completely ridiculous, thought that’s been going through my head since we arrived is that I somehow betrayed my heritage by being American. I know – I had no say in the whole thing. But even as a foreigner (and I do feel like one! ), there’s something about Germany – and especially Bavaria – that feels very right, way down deep. (How can I feel both very much like a foreigner and very much at home? I have no idea!) I’ve found myself wondering where I’d be if my parents hadn’t immigrated in 1953. I’d be… here. I’d be… well, not the me I am. I’ll post again when I can. Maybe tonight, maybe next week! If only I knew!